Do you spend a ridiculous amount of money on food and ingredients? I find myself doing it all the time, and I can totally justify it. It’s food! It’s one the greatest pleasures in life, and I for one am not going to settle from poor quality ingredients. I like the best. Plus, most of the time I cook really simple dishes so the best quality is necessary! So because I’ve spent so much money in the last year or so on food, I must take a step back and re-examine my meal choices. Once or twice a week is fine to splurge on fresh seafood and amazing cuts of meat, but in between I need to be smarter. So far this is what I’ve come up with – a frittata, and 5 serves of soup using some chicken carcases! I’m on the hunt for cheap chicken carcases now, it’s so strange. This frittata I threw together using some leftovers in my fridge, and this is the whole point of cutting back – using what I’ve already got! Frozen peas, check. Mint, check. Eggs, check. Feta, check. 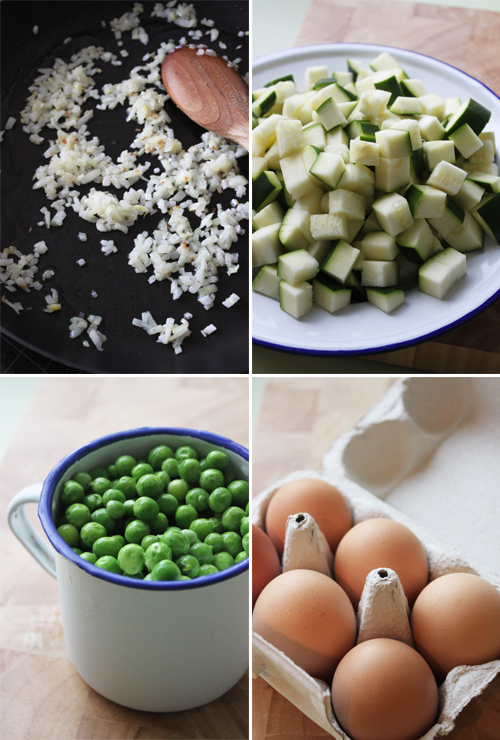 Open you’re fridge and you’ll be surprised at what you can throw into a frittata. Add a good splash of olive oil in a large hot frying pan, and start sautéing the onion. When the onions becomes translucent, remove from the pan. Add the zucchini to the same pan and cook for 10 – 15 minutes. Beat the eggs with a fork in a separate bowl, and season well with salt and pepper. When the zucchini is soft and slightly golden, add the peas and cooked onion to the pan and stir until all ingredients are well combined and evenly spread. Slowly pour the egg over the top, making sure all gaps are covered, then scatter over the feta, and allow the base of the frittata to cook, about 5 minutes. At this point, turn the heat down as you don't want the eggs to cook too quickly and dry out. When you find pockets of runny egg mixture, use a spatula to move the base of that section, which will allow the egg to run to the base of the pan. When the base of the frittata is set, sprinkle over the parmesan (enough to lightly coat the top, not cover) and place the pan under a grill to finish cooking the top. When gold and set on top, remove from under the grill and scatter over the mint. You can serve this hot, warm or room temperature. Your blog is so beautiful! I also spend a ridiculous amount of money on food. I figure since I don't shop for much else though that it's okay. Still it's a good lesson to cut back and be a little more reasonable from time to time. Time to make a frittata! Thank you so much for you comments! 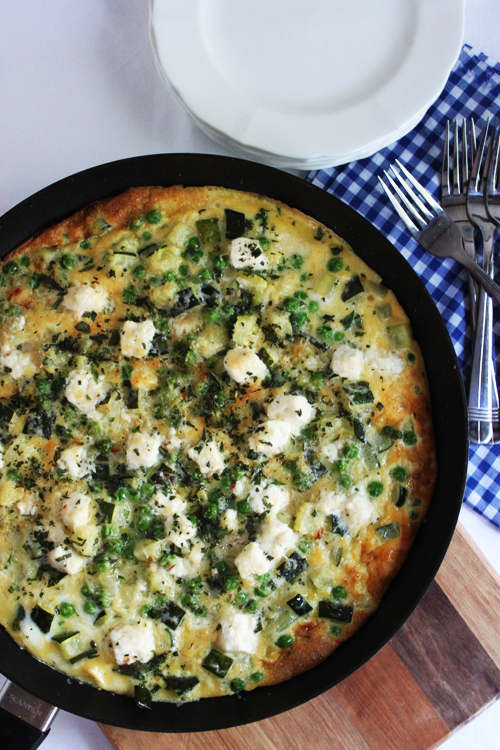 SreeBindu I recommend making a frittata, they are such a great meal for when your tired and have a few random ingredients! I tried this for dinner this evening and it was absolutely delicious. I love the combination of peas, feta and mint - often use it in a salad with maybe just some lettuce and red pepper. Funny enough I made this the other night too, again. I added some broccoli as well, and used haloumi instead of feta - always such a good dish when you're tired!